This Private Estate Wedding in CT gave the couple pictured a natural setting to enjoy as they celebrated. Open sky spreads wide above the couple who gaze forward together, hands intertwined. The sky is painted in varying shades, with a few clouds breaking up the sea of blue. 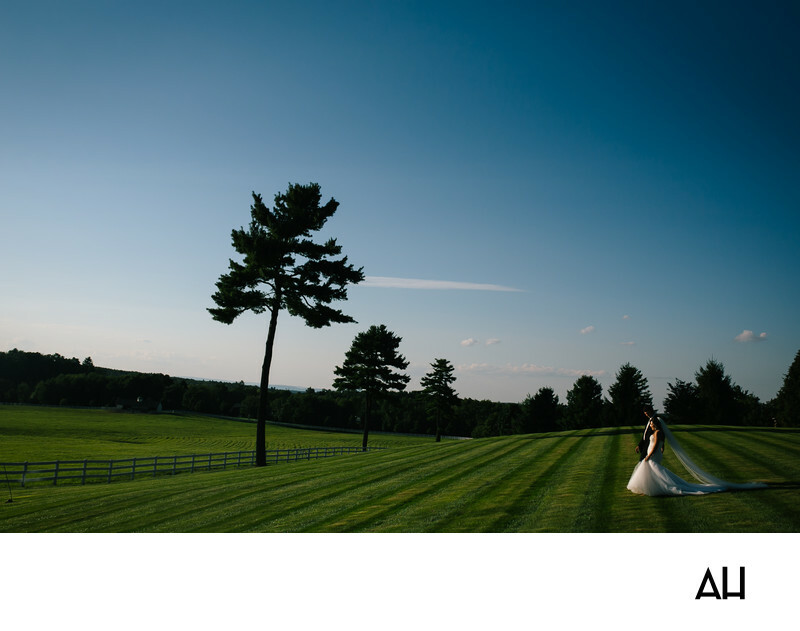 The bride and groom stand upon the perfectly manicured lawn, the only two to be seen for miles. The grass is a vibrant, deep green, that transitions to a darker evergreen where the trees separate the land from the sky. Shadows dance behind the pair, showing that they stand before the sun. It is a symbolic moment that shows the newlyweds facing a bright, beautiful future. The two appear at ease in this setting side by side on the estate’s lawn. The groom is looking down at his wife in adoration. The bride smiles and blushes faintly under the warmth of his gaze, but keeps her eyes ahead to take in the lovely scene before her. The white of the bride’s gown stands out boldly against the color of the grass, drawing attention to its elegance. Her veil and the train of her gown trail behind her, giving her an air of royalty. It is as though she is a princess walking the castle grounds with her real life Prince Charming. Elihu Island, a private island off the coast of Stonington, CT, offers the perfect place to get married.